Action Door knows garages are typically the last place homeowners take time to insulate, but without proper garage door insulation, your home is vulnerable to major energy loss. Living in Northeast Ohio, having a garage and garage door that isn’t insulated can cause higher utilities bills by not keeping air tightly sealed. Even if you have a garage door that is insulated, weather stripping your garage door before winter is essential. 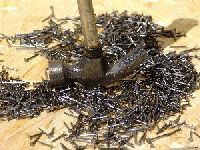 By not taking hammer and nails used for replacing weatherstripping on a garage door steps to winterize your garage, you’re allowing cold air to rush in through small gaps between your garage door and the frame. This is the same thing as going around your entire house and cracking open each window one inch. By weatherstripping your garage door, you can improve the efficiency of your entire home and keep the cold air out. This will ultimately cut down on energy bills and you’ll find yourself more comfortable during the winter months and not constantly running to the thermostat. 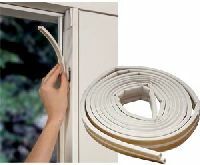 If you are replacing existing weatherstripping, make sure to completely remove the old stripping before installing the new one. Carefully remove the old weatherstripping using a pry bar. Be careful not to bend the frame of your garage during this process. Before installing your new weatherstripping, you need to have the garage door closed. Starting with the top piece, usually called the header, cut square ends using a fine toothed hand saw or hacksaw so that it fits tightly across the top of the garage door frame. Nail the header piece of the weatherstripping in place. Depending on the type of weatherstripping you purchased, there may be guides on where to place the nails. Test your garage door to make sure everything is installed correctly and the weatherstripping doesn’t get caught on the door. For good measure, inspect the weatherstripping in a few days to make sure it’s still in place and isn’t getting caught on the garage door while it’s being operated. Don’t wait until winter to winterize your garage. Action Door are leaders in Northeast Ohio for insulated residential garage doors and want to help you improve the energy efficiency of your garage and home. Get a free quote today and find out how we can help you stay warm this winter.